“Teachaaaah!” for a day – snackettes. This realization came to us even before we left on this trip, as one of our goals was to give back to some of the people and places we would be visiting along the way – particularly given the stark poverty and lack of social infrastructure in the countries in which we were planning to travel. But before I go sounding all philanthropic on you, I should admit that while we are certainly interested helping out where we can, our motives are not entirely selfless: we also want to use these sorts of opportunities to gain a deeper understanding of the places we see. Perhaps the experience would even lead to something longer-term for Steph, now that she’s a PhD-carrying microbiologist! At the least, maybe we’d learn a useful skill or two that we can bring back home (anyone need help building a self-composting toilet?!). Anyway, some initial research on various organizations led us to find that volunteering in foreign countries not only usually requires lengthy time commitments and complex application processes, but it’s expensive as well (as in, you pay them to work for them – often a lot, too)! This makes good sense actually, as the work that organizations do here requires training, and it takes time and money to transition a volunteer from a burden to an asset. But this realization also meant that it would be difficult for us to serendipitously find opportunities along our way, given that we rarely know where we’ll be a week from now, nevermind 3 months from now! In Thailand, we contacted 3 different WOOFing startups to offer our skills time, but unfortunately, never heard back. We hoped this wouldn’t be the case for the entire trip! Alas, in Battambang, Cambodia we came across an opportunity that sounded too good to pass up. KNGO (stands for “Khmer New Generation Organization”) is a local Cambodian-run organization that aims to “provide a free education program with a curriculum of several workshops, such as: English literacy education, computer skills, moral education, primary health education, environmental education and vocational skill training.” Essentially, they offer free education, primarily in English skills to kids every weekday afternoon, after the kids get out of state-run school around noon and would otherwise be susceptible to drug use and all sorts of atrocities that aren’t as common in more developed countries. Saveth, the founder of KNGO, saw the need for more comprehensive education for the kids in his village (including his own children), and convinced the state to let him keep the school buildings open in the afternoons to conduct his classes. To do it, he recruited the help of 5 or so Cambodian teachers, most of whom are currently studying English at university, and foreign English-speaking volunteers who are asked to help for a day, a week, or more as they pass through town. In return, Saveth and his family offer a homestay at their own house in rural Cambodia, and 3 home cooked meals a day, all for $10 – sounded like a good deal to us! The moment we arrived and registered, we were put to work. We had a couple of hours until the kids arrived, and the few other volunteers there with us that day were editing a proposal that KNGO would send to a few organizations in hope that they’ll help with funding. Like all-to-many charitable organziations, KNGO is strapped for cash, and at any time, it’s unclear whether they’ll still be open even two months from then. Fortunately, they don’t have a lot of operating costs: the facilities are all free and the school supplies were graciously donated by a couple from Australia, but they do need to pay their teachers and some other administrative fees. And of course, most of their budget is based on donations from foreign contributions to their website. We spent an hour or so editing and brainstorming some websites and organizations that might be good for stirring up some money. KNGO school runs from 3-6pm, but most of the kids like to get there around 1pm. 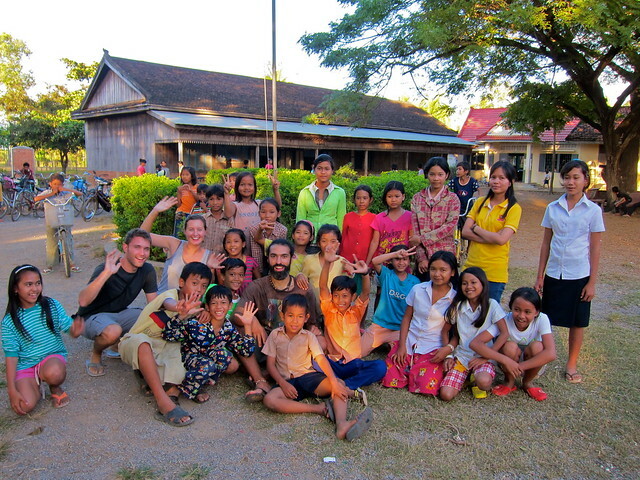 Yes, you read that right: the kids in Battambang are very fired up to learn! So between 1 and 3 the two days we were there, the kids picked out books – usually of the “name that animal” variety – and read them aloud to us volunteers, while we helped with pronunciation. This made for a good opportunity to meet some of the kids that we’d be teaching later that day. Each day, there were 3 hour-long class sessions divided up into 4 classrooms, and each session had a slightly older group of kids. We started each session by walking into the classroom after all the students were seated and introducing ourselves, writing our names on the board in classic teacher style. Every single time, our introduction was met with a piercing, “HELLOO TEEEACHAAH! !” (spoken with an English accent, likely due to a former British volunteer), and questions, “how old are you?,” “what’s your favorite flower?,” “do you like Cambodian food?,” etc. (29 & 28, lotus, and YES, for what it’s worth). For the first session, we sat at the back and observed another volunteer help conduct the class along with the hired Cambodian teacher. The process went as you might expect, with the kids filling out worksheets on basic sentence construction, reading aloud, and writing on the chalkboard. After class was over each day, we headed back to KNGO headquarters for dinner, cooked by Saveth’s family. Here they are prepping a fresh rice (straight off the fields without drying) and coconut dessert, and below, one of the sweet Thai-basil noodle salads they made for us. Our time with KNGO was short, but we left feeling really good about the organization and our small contribution there. Saveth and the others at KNGO clearly have their priorities in the right place, particularly considering that 50% of the population in their country is under 22 years old. It’s also uplifting to see a great example of Cambodians beginning to help themselves (albeit with outside assistance) out of some of their major problems, especially in a place where foreign-run NGOs are commonplace. Scott and Steph — SO AWESOME!!! Made me think of one of my favorite language learning games/exercises from Ukraine – great with little kids, could be useful if you have another opp. Called “People to People”, it’s a game to test how well a class knows names of body parts. Works best with an odd number: All kids pair up. One person is “it” and gets to lead the group by calling our two body parts — e.g., “elbow to knee”, “shoulder to shoulder”, “ear to nose”, “toe to finger” etc.– and each team needs to actually connect person A to person B correctly. Great, because if the kids don’t know a word they can look around at others and figure it out. After a few calls, the leader can yell “People to People” and the pairs run around to find new partners (a la musical chairs) with the last person standing being the new “it” person/leader. With little kids especially, it’s totally hilarious.